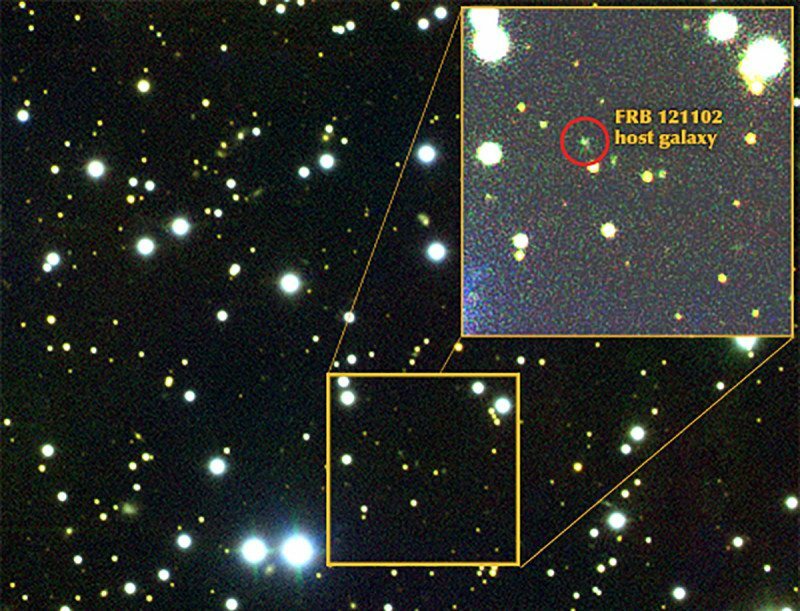 Astronomers have detected 15 repeating Fast Radio Bursts coming from FRB 121102, located in a dwarf galaxy about 3 billion light-years away from Earth. The researchers note that FRB 121102 is presently in a "heightened activity state, and follow-on observations are encouraged, particularly at higher radio frequencies". 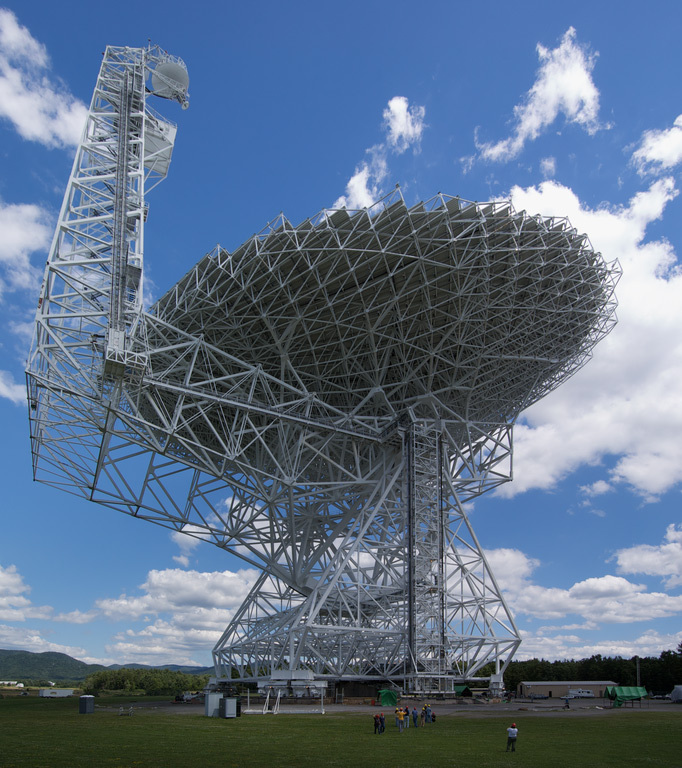 Breakthrough Listen – a $100 million program to look for evidence of extraterrestrial communications in the Universe – is the most comprehensive and detailed search ever undertaken for artificial radio and optical signals beyond Earth. The project was started in January 2016 by Russian entrepreneur, venture capitalist and physicist Yuri Milner, as part of his Breakthrough Initiatives program, and is expected to continue for 10 years. Astronomers are studying radio wave observations from Green Bank Observatory (West Virginia, USA), Parkes Observatory (New South Wales, Australia) and the Automated Planet Finder (California, USA). They have just announced the detection of 15 fast radio bursts (or FRBs) emanating from the mysterious "repeater" known as FRB 121102. FRBs, are brief, bright pulses of radio emission from distant galaxies. First detected with the Parkes Telescope, FRBs have now been seen by several radio telescopes around the world. FRB 121102 was discovered on 2nd November 2012 (hence its name). In 2015, it was the first FRB seen to repeat, ruling out theories of the bursts' origins that involved the catastrophic destruction of the progenitor (at least in this particular instance). And in 2016, the repeater was the first FRB to have its location pinpointed with sufficient accuracy to allow its host galaxy to be identified. It is now confirmed to reside in a dwarf galaxy about 3 billion light years away from Earth. Attempts to understand the mechanism that generates FRBs have made this particular galaxy a target of ongoing monitoring campaigns by instruments around the world. Possible explanations for FRBs range from outbursts from rotating neutron stars with extremely strong magnetic fields, to more speculative ideas that they are directed energy sources used by extraterrestrial civilisations to power spacecraft. In the early hours of Saturday, 26th August 2017, UC Berkeley's Dr. Vishal Gajjar observed the location of FRB 121102 using the Breakthrough Listen backend instrument at Green Bank Telescope in West Virginia. The instrument accumulated 400 TB of data on the object over a five hour observation of the entire 4 to 8 GHz frequency band. This huge dataset was searched for signatures of short pulses from the source over a broad range of frequencies, with a characteristic dispersion or delay as a function of frequency, caused by the presence of gas in space between us and the source. The distinctive shape that the dispersion imposes on the initial pulse is an indicator of the amount of material between us and the source, and hence an indicator of the distance to the host galaxy. Analysis by Dr. Gajjar and his team revealed 15 new pulses from FRB 121102. As well as confirming that the source is in a newly active state, the high resolution of the data obtained by the Listen instrument will allow measurement of the properties of these mysterious bursts at a higher precision than ever possible before. The observations also show, for the first time, that FRBs emit at higher frequencies (with the brightest emission occurring at around 7 GHz) than was previously observed. The extraordinary capabilities of the Listen backend, which can record several gigahertz of bandwidth at a time, split into billions of individual channels, enable a new view of the frequency spectrum of FRBs, and will shed additional light on the processes giving rise to FRB emission. When the recently-detected pulses left their host galaxy, our Solar System was just two billion years old. Life on Earth was only single-celled organisms, and it would be another billion years before even the simplest multi-cellular life began to evolve. Whether or not FRBs eventually turn out to be signatures of extraterrestrial technology, Breakthrough Listen is helping to push the frontiers of a new and rapidly growing area of our understanding of the Universe. These new results will be described in more detail by Dr. Gajjar in an upcoming scientific journal article. Green Bank Telescope, West Virginia. By Geremia at English Wikipedia [Public domain], via Wikimedia Commons.